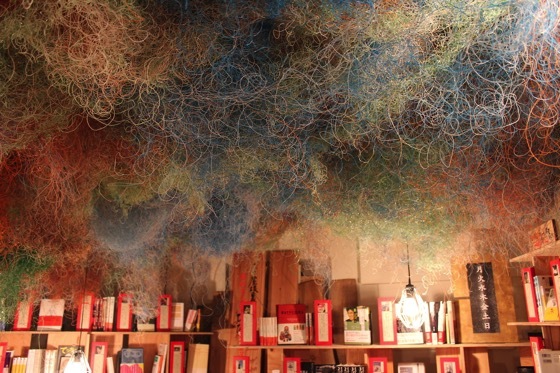 A group show was displayed across a 6 floors office building in the heart of Ginza. This 84 year old building once served as Nagoya’s House of Commerce and will soon be demolished. 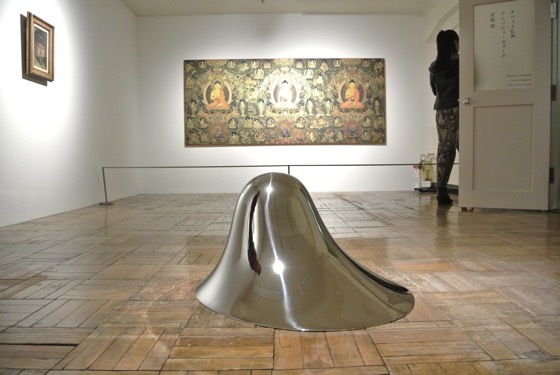 The Curator, Toshio Shimizu created a show of various mediums of art, from videos to paintings, sculptures and installations. In addition to that the exhibition held lectures and artist talks almost everyday.’The Mirror’ is a world to be discovered little by little, with time and an open mind. 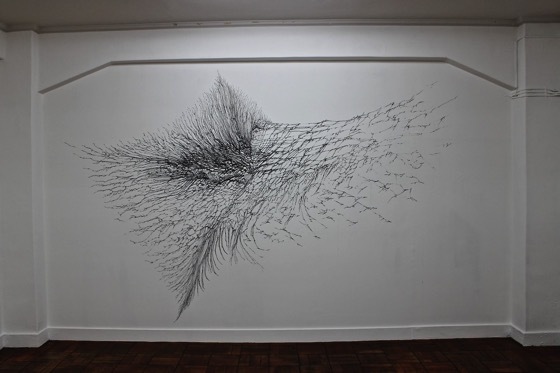 Motoka Watanabe’s “The mine #402″. Actually, there’s no mirror between the two. Hamlet explores themes such as existentialism and relativism, how the truth and the reality of things are subjective, and so are reflections in a mirror. Our identities are mirrored to us based on the society. To compose his vision Toshio Shimizu assigned 33 artists, among them are Anish Kapoor, Nicolas Buffe, Yuumi Domoto, Tatzu Nishi and Jenny Holzer. 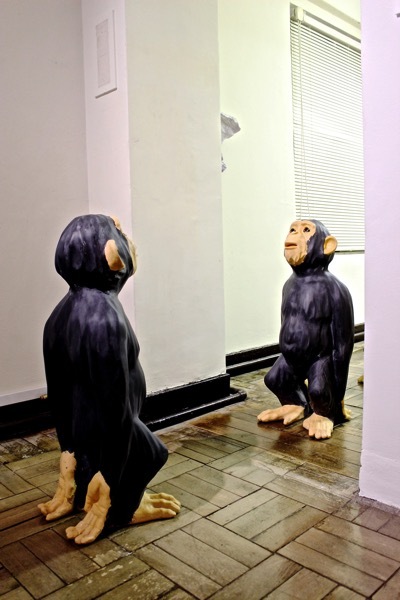 In this exhibition, the visitor has to wonder through small corridors into small rooms, typical of any office buildings, which makes the experience somewhat playful, ironic and unique. At the reception area, there are two aquariums which is the result of Kosei Komatsu and Kensho Miyoshi’s collaboration specially for this exhibition. 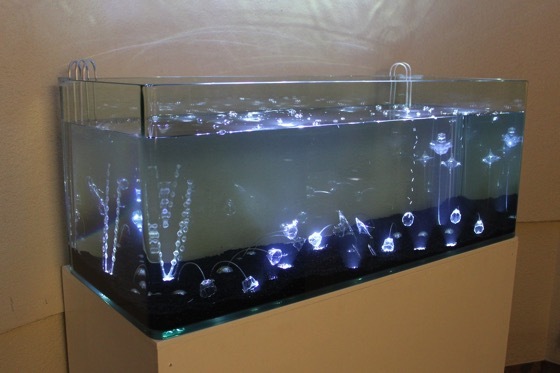 The medium of water is used to create fantastical forms, resembling a make-believe version on the bottom of the ocean. 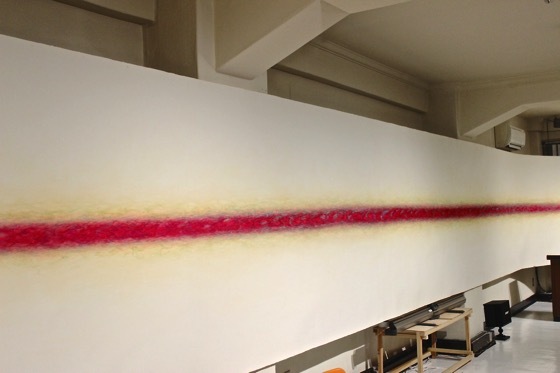 In the room used for lectures is the existentialist work of Shingo Francis “Bound for eternity (red)” (2008), an horizon- tal line that symbolises the beginning of life. 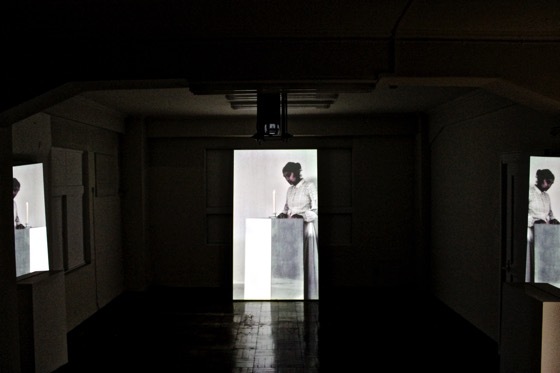 Another obvious reference to Hamlet’s sophist philosophy is Hiraki Sawa’s projection of a dark girl in a white dress lighting a white candle, however her doppelganger blows it out. Across the room there are 3 mirrors from which one can see the reflection of this girl’s repeated ritual, from different angles. 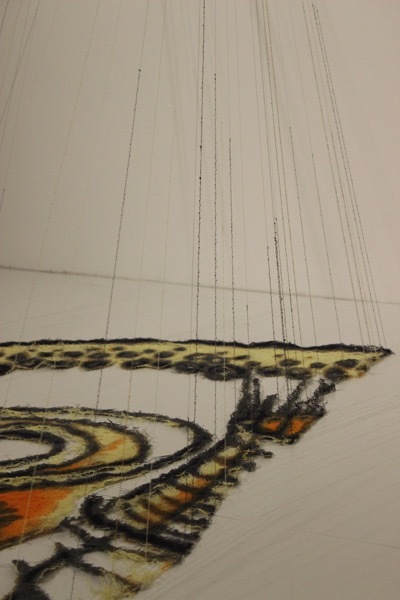 Detail of the work. 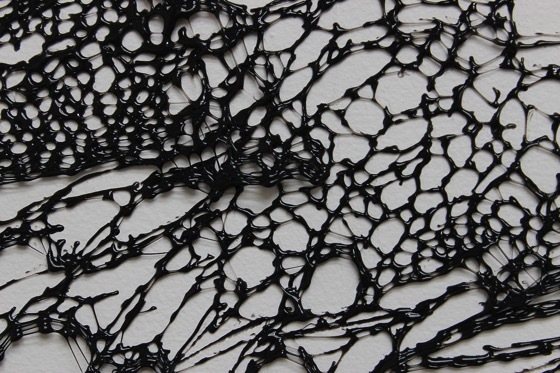 A web of black glue that produces an exceptionally organic impact. 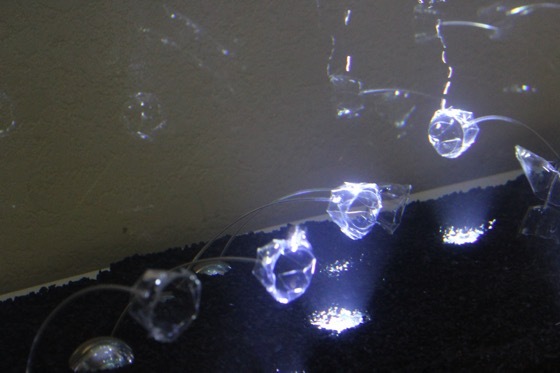 On the same floor of Nawa, the visitor encounters Satoru Tamura’s “Point of Contact for Incandescent Lamp #16″, this installation shows a lamp which 200 watts switch the device that makes a laser move. 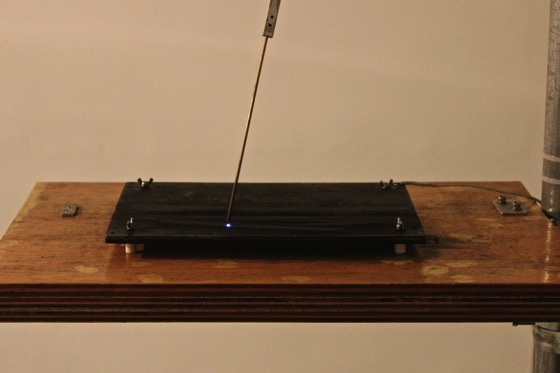 This laser moves in an inconsistent way, and draws a line which is equally inconsistent and imperfect. 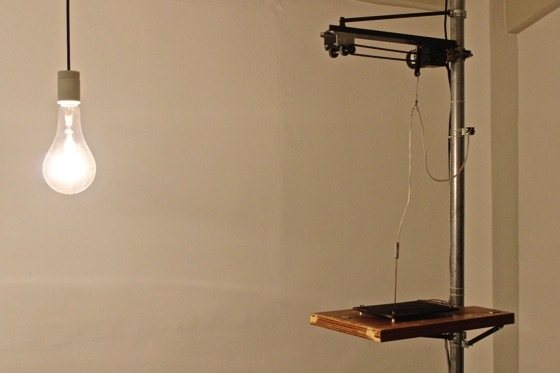 This work depicts humans’ inability to control electricity, to control their own inventions. 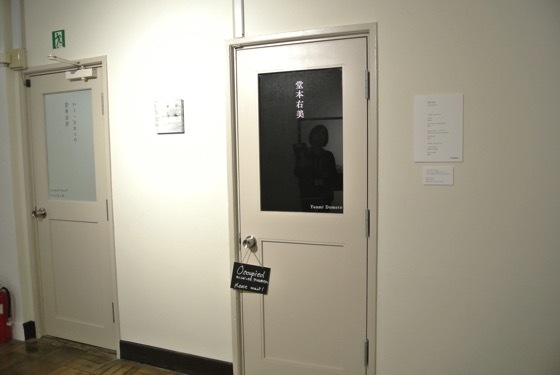 Alluding to this building’s past activities Kimio Tsuchiya created ‘Conference Room 305′. 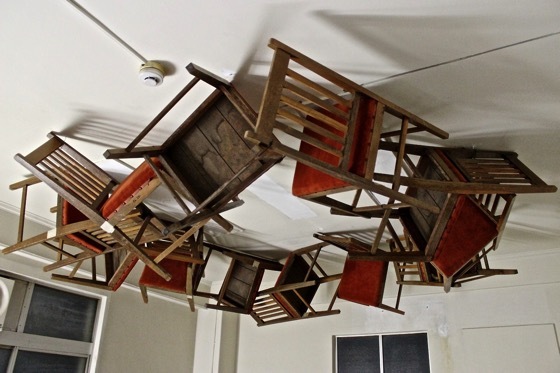 This piece comprises chairs wired to the ceiling in a circle as if they are floating in the air after the end of their lives. The result is very graphic and pleasing to the eye. From this room one can access an even smaller one, the world of Nicolas Buffet, “…the illusory depths of the mirrors.” The whole room is covered in black card board, with a pop up mirror and other ornaments drawn in white chalk. 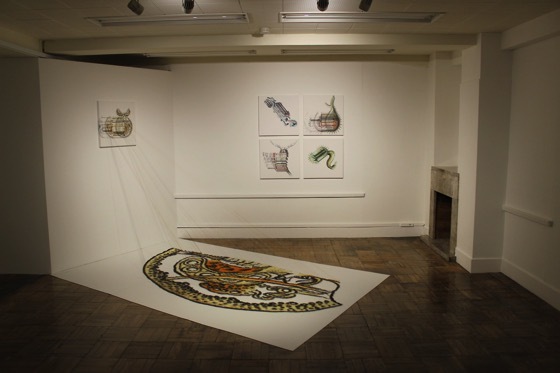 The artist spent two days inside this room drawing by hand every single detail and the result is like being inside a book. 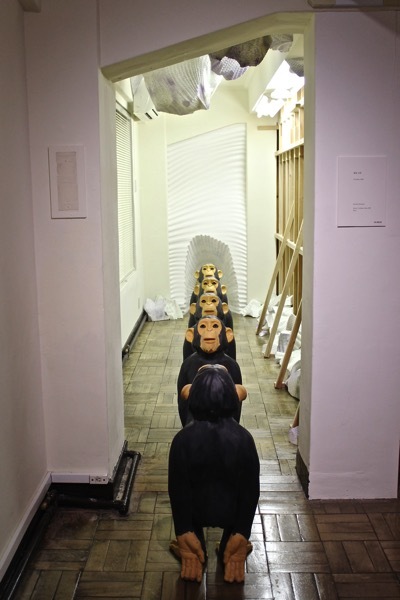 Also the visually impressive piece is Motoka Watanabe’s “The mine #402″, with look-a-like monkeys standing in formation like in the army in front of another monkey, it almost looks like the repeated reflection of this main monkey, another mirror allusion. Jinba Keisuke “B.T.P. (Food)”. 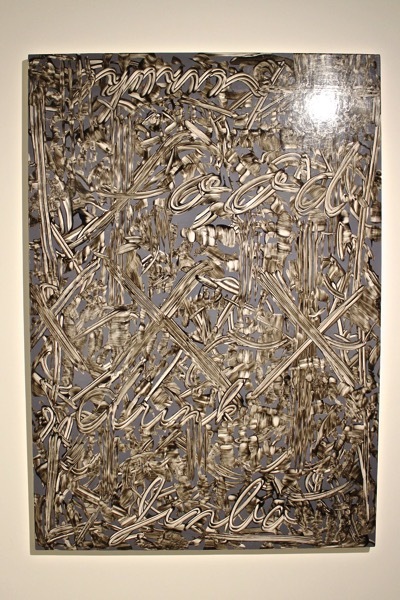 At first, this piece looks like a collage but on a closer look, the viewer realizes that it is in fact a painting. The most representative artwork of this exhibition is Yuumi Domoto’s “Hold the mirror up to nature.” Yuumi Domoto wanted to paint time, in order to do that she created a pitch black room, with a very dimmed light, almost non existent, where the visitor seats alone for 3 minutes until his eyes get used to the dark and he can finally see her painting. The tenebrous background sound helps the very intimate experience. 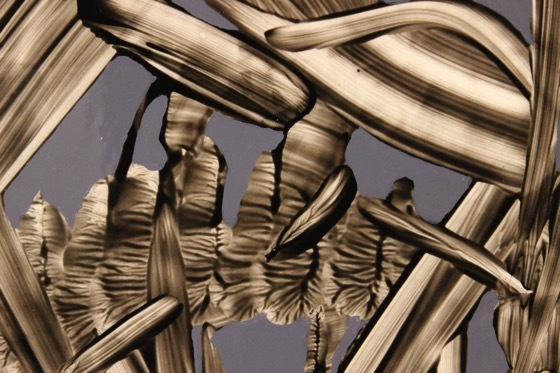 Yuumi Domoto “Hold the mirror up to nature.” Go inside of this dark room to see a painting. ‘The Mirror’ has a bookstore curated by books’ collector Seigo Matsuoka. The space was de- signed by Kengo Kuma, the ceiling is covered with the insides of LAN cables in their original colours, laying on wooden shelves filled with books, these fresh cuts of wood give the room a very fragrant smell. A room with a strong statement is followed, with “3 Buddha” a classic work painted by Tibetan monks at the Jonangpa School. The three buddhas represent: past, present and future. Facing this painting is Natsuyuki Nakanishi’s “Receptive Reading”, between the two paintings stand Lee Ufan’s “Dialogue” and Anish Kapoor’s “Untitled” (2004). The name of the artworks make the in- tentions of the curator very self-explanatory, a dialogue between the past and the present in which Anish Kapoor acts like a mediator. On the 6th and last floor are Tatzu Nishi’s photographs, these staged images at public or land- mark locations, are filled with sarcasm and humour. 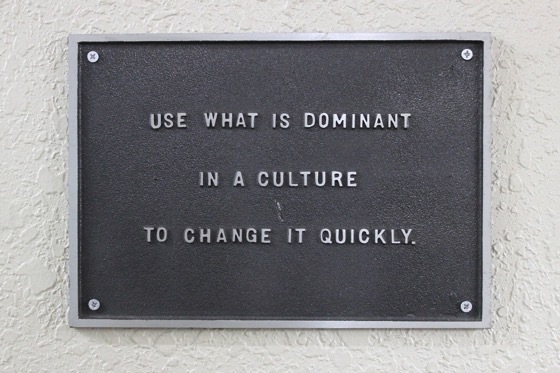 The artist reimagines spaces giving them completely different proposes, and this premise prepares the visitor for the conclusion of “The Mirror” with the following inscription: “Use what is dominant in culture to change it quickly”, by conceptu- al artist Jenny Holzer. At “The Mirror” the visitor experiences a deep connection between art, literature and Philosophy, that just like a reflection on a mirror can be interpreted and experienced in many different ways. None of these ways are the right or the perfect ones, they are just moments in our current lives that will be transferred into our future and might even take us back to our past.